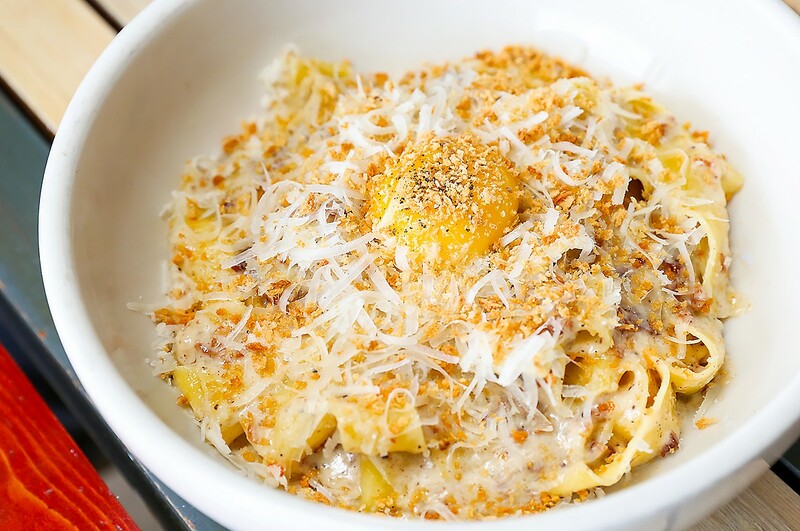 Cane Rosso Has One Of Houston’s Newest & Most Decadent Brunches! The Breakfast Taco Pizza at Cane Rosso with chorizo, serrano peppers, potato, tomato, egg, onions and cilantro lime crema. Photo by Jeff Amador. Cane Rosso has long been known as the gold standard for authentic Neapolitan-style pizzas in Texas. Now, it’s also becoming known for one of Houston’s newest brunches! Both Cane Rosso locations in Houston now serve everyone’s favorite weekend meal from 11 a.m. to 3 p.m. — not just on Sundays but on Saturdays, too! The menu runs the gamut and there are dishes to satisfy adults and kids alike. Some are elegant affairs with distinct Italian influences, like the Brunch Carbonara Benedict Casserole with biscuit crumbles, bacon bits, a 63-degree egg and truffle cream sauce as well as our acclaimed burrata accented with balsamic cherries, pecans and fried basil served with crostini. The Brunch Carbonara Benedict Casserole at Cane Rosso. Photo by Jeff Amador. 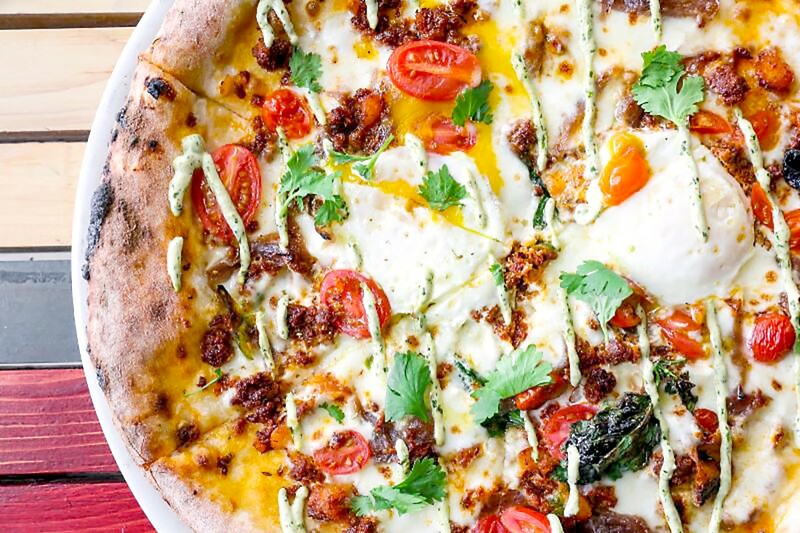 The Breakfast Taco Pizza is an Italian and Tex-Mex twist complete with chorizo, serrano peppers, potato, egg and refreshing cilantro-lime crema to calm your taste buds. Others, like the Cap’n Crunch Waffles with condensed milk syrup and fruity pebbles crunchies, are great for both kids and kids-at-heart who will feel like they’re in their pajamas watching Saturday morning cartoons again. The cereal waffles also make an appearance in our Chicken and Waffles, this time with fried chicken, habanero syrup, cheese sauce and bacon marmalade. Our fried mozzarella with tomato sugo and pecorino seasoning is also a crowd-pleasing favorite. 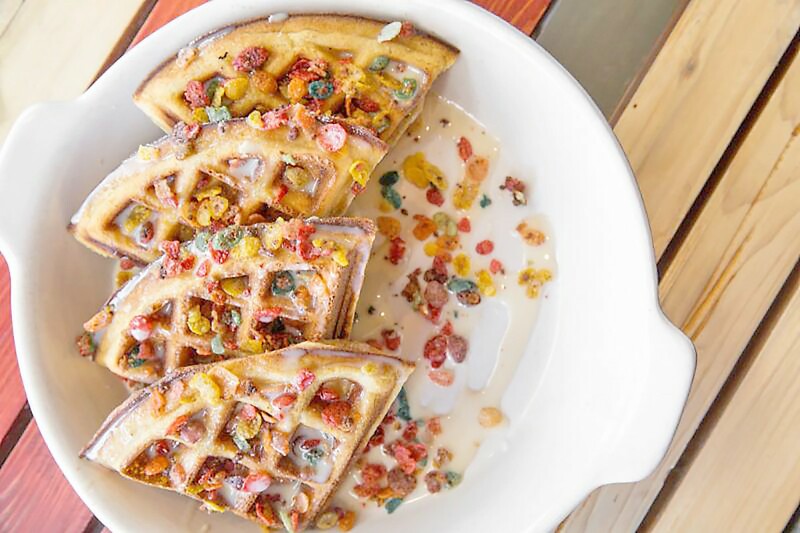 The Cap’n Crunch waffles at Cane Rosso are great for kids and kids-at-heart alike. Photo by Jeff Amador. Diners with hearty appetites will love the Mother Clucker —fried chicken, bacon marmalade, habanero honey sandwiched between a buttermilk biscuit — as well as our take on poutine with cheddar tots, sausage sugo, cheese sauce, and bacon bits topped with a fried egg! Believe it or not, all those dishes are just a small sampling of the entire brunch menu which is viewable online. Of course, our authentic Neapolitan-style pizzas are also available. Together with $1 Mimosas and $3 Bloody Marys, Cane Rosso is the perfect brunch destination. Visit our Montrose location at 4306 Yoakum or in The Heights at 1835 North Shepherd Drive!